North Korea responds to Trump in bluster war escalation. President Donald Trump speaks about North Korea at the Trump National Golf Club in Bedminster, New Jersey, on Tuesday. A day after both Donald Trump and Kim Jong-un announced to the world they were officially playing with fire, North Korea ratcheted up the conflict rhetoric yet again with the country’s state media announcing Pyongyang will have completed a plan by mid-August to fire four ballistic missiles within 18 to 25 miles of the U.S. territory of Guam. The incendiary statement comes after both leaders poured kerosene on the countries’ dispute over North Korea’s fast-advancing nuclear program. The North Korean statement released by state media mouthpiece KCNA quoted Gen. Kim Rak Gyom, head of North Korea’s rocket command, as saying North Korea was “about to take” military action against Guam. Overheated rhetoric from Pyongyang is nothing new, but what’s different this time around is that the U.S., last November, elected a president who doesn’t have any idea what he’s doing. That’s just a fact. This isn’t Survivor. This is real life. But here we are. There is no doubt that North Korea is an increasingly urgent problem that will require U.S. attention, perhaps sooner rather than later, but having a commander in chief who is constitutionally incapable of not checking his mentions much less letting a slight go, isn’t helping. Trump successfully personalized the spat and drew an arbitrary red line. “North Korea best not make any more threats to the United States,” Trump told reporters Tuesday. “They will be met with fire and fury like the world has never seen.” The display of unbridled, totally unnecessary machismo may play well with his base, but his base doesn’t have nukes. North Korea does. And North Korea responded to Trump’s red line with another threat the following day. Now what? It’s a rookie mistake of such colossal proportion it’s hard to even know where to start. The first thing it would be important for the president to acknowledge is that diplomacy and negotiation are real things that when done well can lead to far different outcomes than when done poorly. Second, talking tough is great if it works, but jumping ahead five steps and threatening hellfire doesn’t exactly leave any wiggle room for negotiation. Where’s the out? Where’s the artistry of this deal? And, to be clear, the ideal outcome here is a negotiated de-escalation that allows for the U.S. to pursue other avenues to achieve the goal of dismantling Pyongyang’s nuclear arsenal. Just a reminder to the president of the United States and the Bannon “global reckoning” wing of the White House. 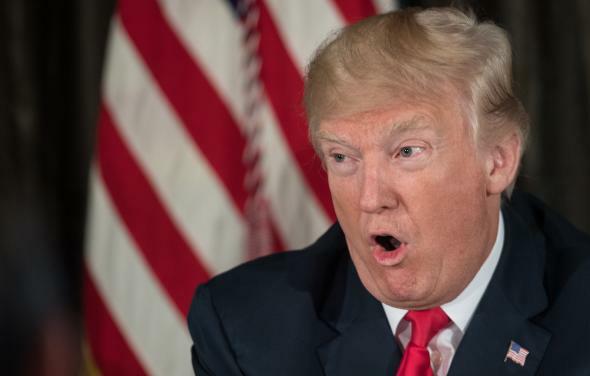 North Korea, sensing it had struck a nerve with the historically green American president, followed up Wednesday by taunting that Trump “let out a load of nonsense about ‘fire and fury’ ” and “sound dialogue is not possible with such a guy bereft of reason and only absolute force can work on him.” The president of the United States has managed, so far, not to return fire in the bluster war, which is a good thing, because each time he does respond it makes it more likely that we’ll all be involved in a real one.